This is my third year competing in the Distance Derby, an online riding competition for mileage. The first year, I pushed pretty hard - riding all the way to the end of December - to hit just over 1,200 miles and placing in the top ten. Last year I was tired. I logged just under 700 miles and finished 25th out of 81 riders. For those who think they ride a thousand miles every year, start GPSing your miles. You will be surprised how much time it really takes in the saddle to reach 1,000 hours, especially when you work full time! This year I have managed to pass what I rode last year. 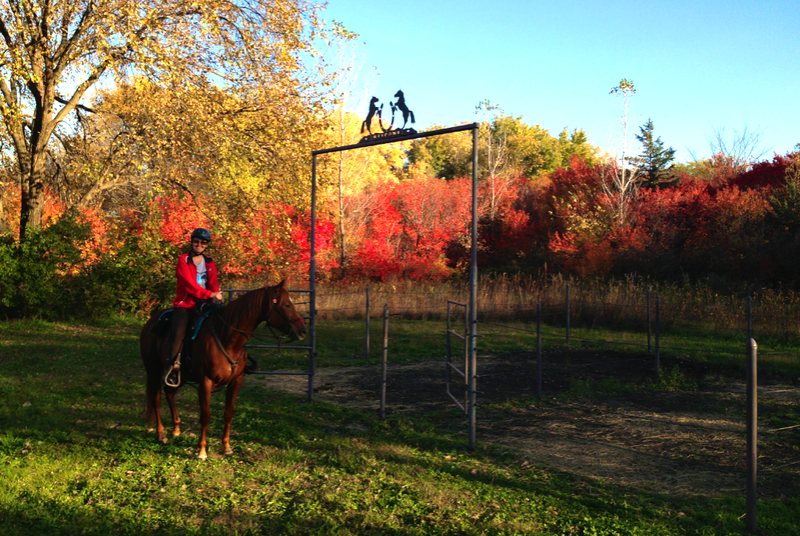 October has been so nice that it is hard not to be in the saddle. I can see 1,000 miles in site, but it will take quite an effort to reach it by the end of the year. But I'm going to give it my best shot. There are more riders this year, so I hope to still finish in the top 25. 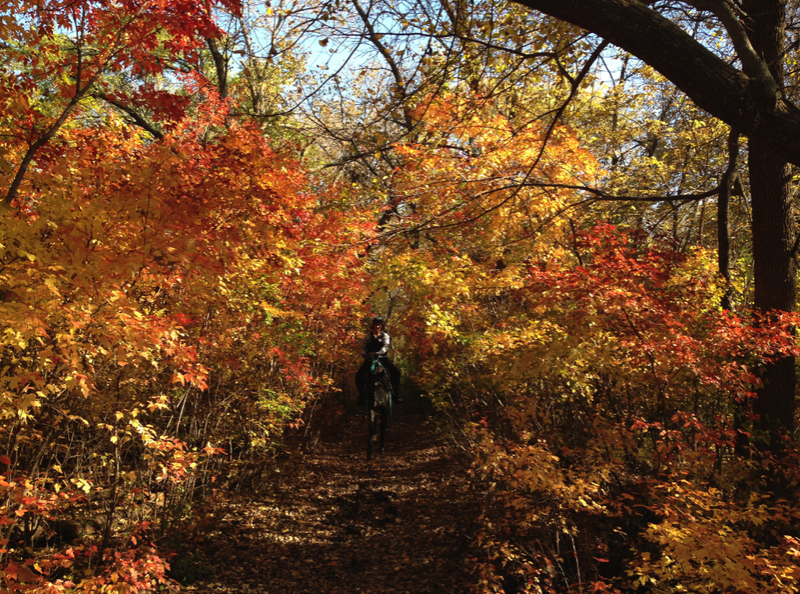 Last weekend I did a quick 15 miles on Friday on Windy with Juanita, another Derby rider. 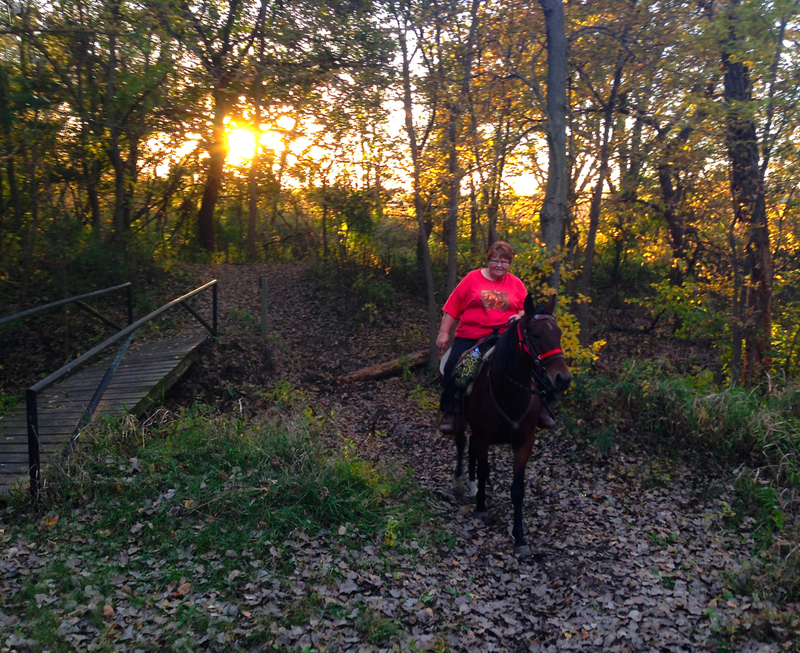 Then on Saturday, I took Fancy out to Pawnee Lake, northwest of Lincoln, and rode with Derby riders Mary and Diane. Pawnee has never been my favorite ride and it has nothing to do with the trails but more to do with having bad rides on fussy horses. But I have to say, this past year I have grown to enjoy it. 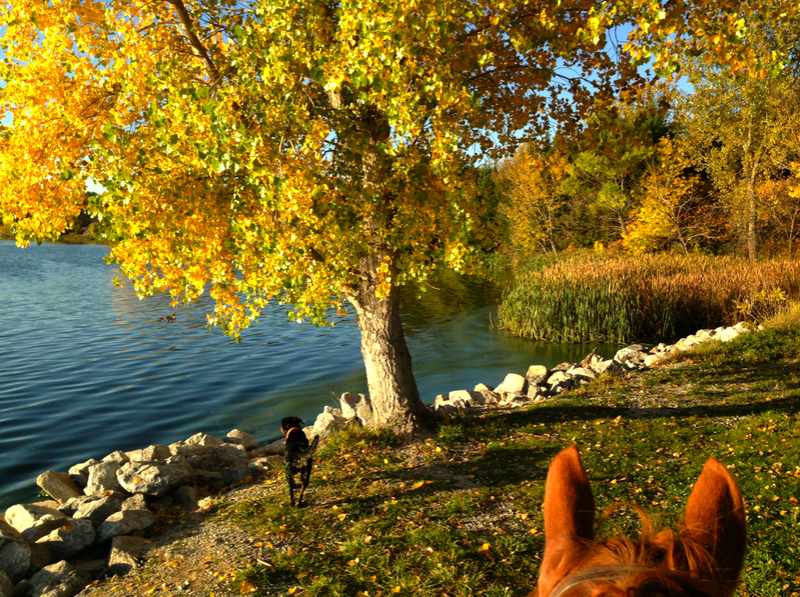 Not a lot of trails - about 8 miles around the lake is all, it is perfect for a quick ride or longer if you go around twice! Mary coming thru the trees. Yes, there is a person and horse in there! What surprised me last week was the color at Pawnee! 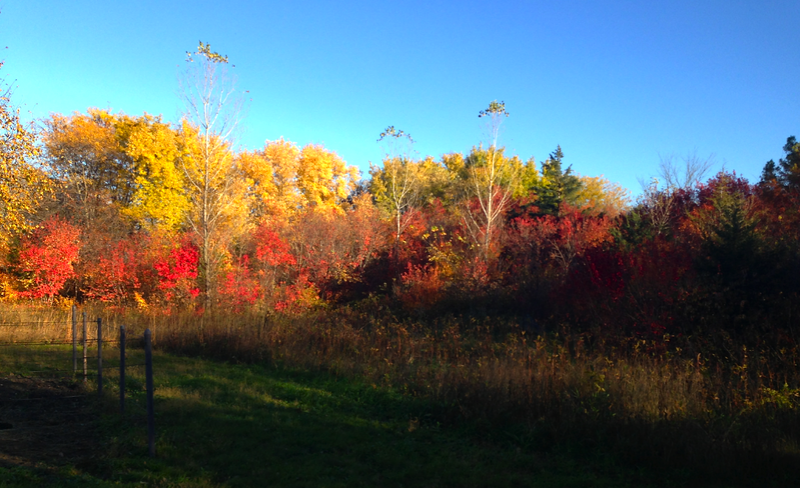 While there are some wooded areas through the wildlife area, I never thought I would see such brilliant colors! What a treat. 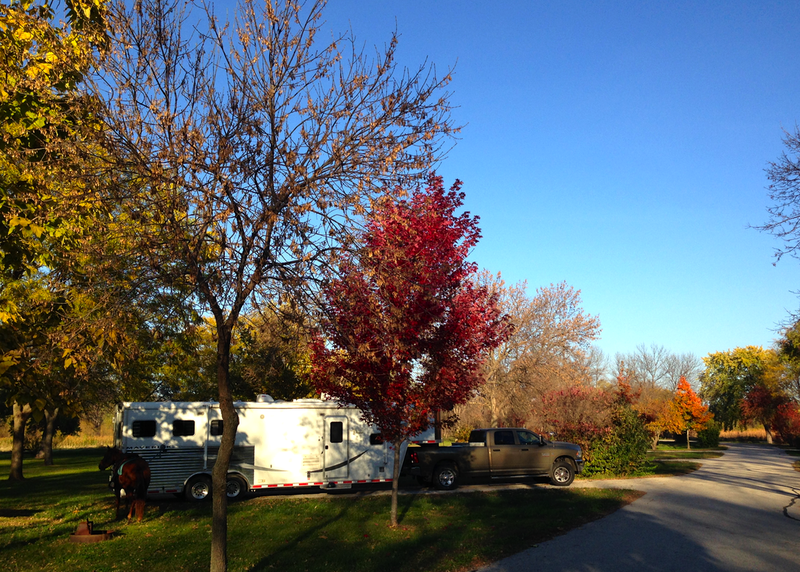 I told John when I bought this trailer and the new truck, it wasn't going to sit at home; I planned to use it. He had things he wanted to do that didn't include riding so I spent the night at Pawnee. Just Fancy, Nahla (my son's dog) and me. It was a lovely evening temperature wise, but without having a heavy frost yet (for which I am grateful), the mosquitos drove me into the trailer earlier than I would have liked. Nahla was like a dog with ADD. She loved being out! 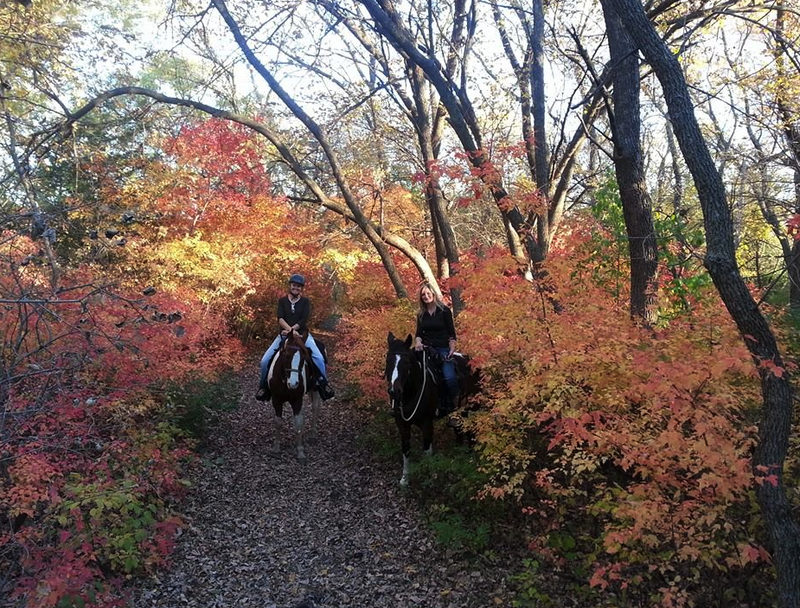 The next morning, Fancy, Nahla and I did a quick ride just after the sun came up and then I loaded up and headed over to Branched Oak to ride with the NECTRA group before their scheduled meeting. 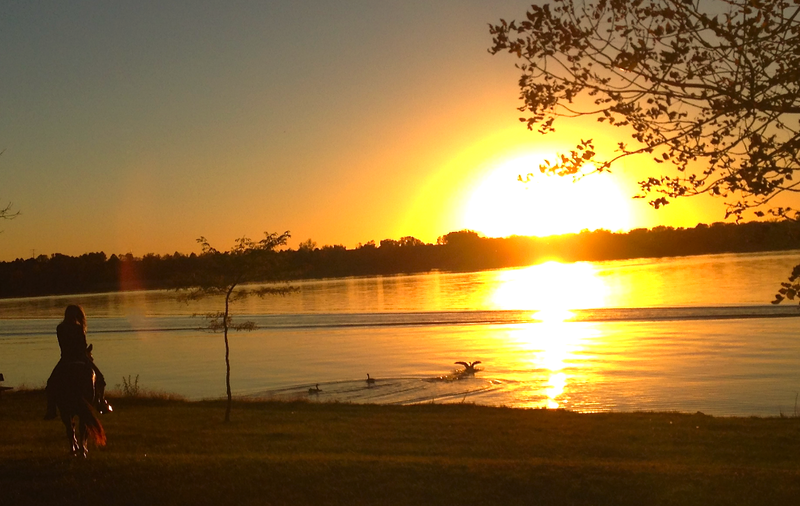 After reporting to my friends how pretty Pawnee Lake was, Kathy and Tanya met me out there Monday after work. 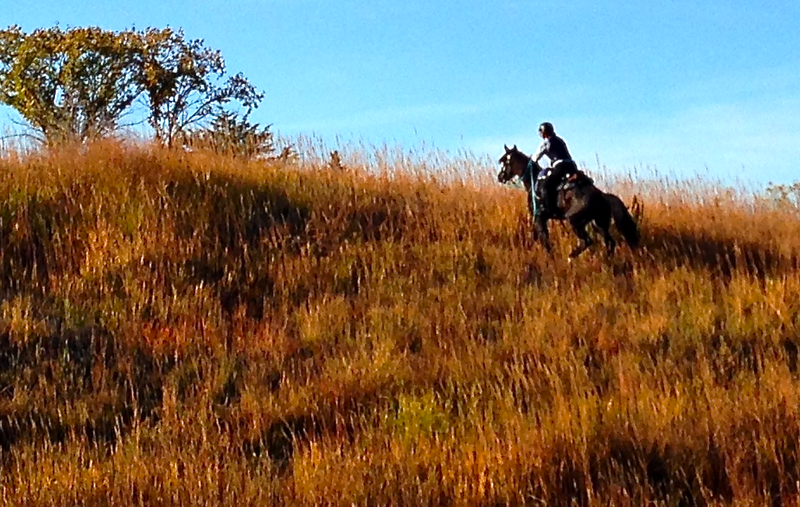 Time prevented me from hauling my own horses so Kathy brought me her fox trotter, Zuni, to ride for the evening. Spots and gaited! Something you don't see me on too often! These pictures were all taken at Pawnee Lake over the course of three days and in no particular order. I just wanted to show you the beauty that my eyes saw but believe me, it was hard to capture in the pictures. I hope you are having a happy fall! Loved your Post. Just gorgeous pictures and looks like so much fun! Beautiful pictures Tammy. It has been a lovely Fall. Routing for you- that you reach your 1000 mile goal.